Real Madrid showed no mercy against in today's match against Eibar and ran over the vistors with an easy 4-0 win. James, Lucas Vázquez, Cristiano Ronaldo and Jesé all scored a goal each in the first half, which naturally allowed Real Madrid to slow down the tempo after the break and immediately put their minds on this Tuesday's battle against Wolfsburg. And just like that, Real Madrid have cut down the gap to Barcelona from 10 to 4 points, after beating Eibar this Saturday's afternoon by 4-0 and capitalizing on another Blaugrana slip, this time at the Anoeta against Sociedad. In Madrid, it was all about putting the game to sleep as soon as possible and that's precisely what Zinedine Zidane's men were able to do. The hosts found themselves 3 goals up still before the game had reached its 20th minute, thanks to goals from James Rodríguez, Lucas Vázquez and Cristiano Ronaldo. Later in the half, Jesé would seal the deal with the last nail in Eibar's coffin, in a player that allowed Ronaldo to also add his second assist in the game. Next Tuesday, the Bernabéu must rise in another Champions League night game, this time to help Real Madrid completing the comeback against Wolfsburg. It was a revamped Real Madrid side that Zidane picked out for today's league fixture against Eibar, as the Frenchman decided to bring plenty of changes to the hosts' starting eleven, following the disappointing loss in mid-week against Wolfsburg. Keylor Navas gave his place to Kiko Casilla, while the back four line only saw Pepe holding on to his starting spot, with the likes of Nacho, Arbeloa and Carvajal all stepping in to give some rest to players like Sergio Ramos and Marcelo. In midfield, it was Casemiro who remained in the lineup, as Isco and and James Rodríguez were both given the opportunity to start and show to Zidane he can trust on them for more important games as well. The opener arrived very early in the game, with James Rodríguez scoring from a free-kick already very near the inside of Eibar's penalty box. The Colombian picked out the low corner and didn't give many chances to Asier Riesgo to stop his strong and accurate strike. That was the Colombian's 6th league goal this season and his 24th for the club in all competitions since he signed for the Merengues back in the summer of 2014. Eibar approached today's first half with a very dangerous mindset, pressing high and moving their defensive line as high as possible on the pitch. Doing that in the Bernabéu can easily turn out to be a perfect recipe for disaster and Real Madrid made sure that Eibar would pay for their dauntless approach. 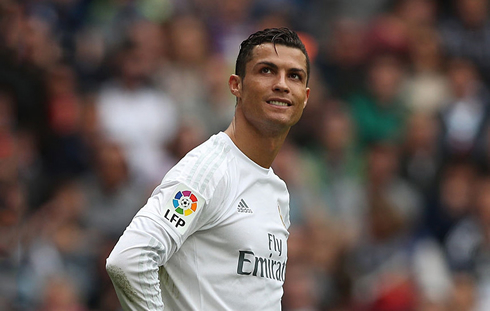 In the 18th and 19th minute, Real Madrid would add 2 more goals to their total. First it was Lucas Vázquez finishing off with his left foot after a good assist from Cristiano Ronaldo. A few instants later, it would be the 31-year old superstar writing his name on the scoresheet, following an assist from Jesé Rodríguez. The Portuguese forward had no difficulties in scoring his 30th league goal this season and becoming the first player ever to score at least 30 goals in La Liga for 6 consecutive seasons. Attackers: Lucas Vázquez, Cristiano Ronaldo, Jesé Rodríguez. 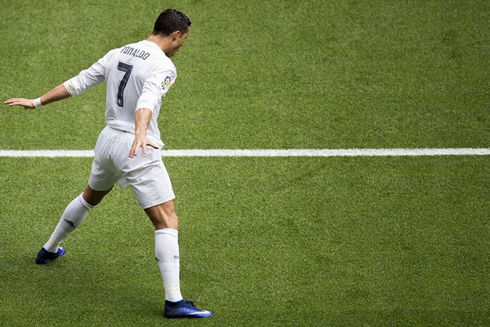 Cristiano Ronaldo next game with Real Madrid for the UEFA Champions League is on April 12 of 2016, against Wolfsburg. You can watch Juventus live stream, Real Madrid vs Wolfsburg, Liverpool vs Stoke City, Tottenham vs Manchester United, Sunderland vs Leicester City, and Schalke 04 vs Borussia Dortmund, all matches provided from our live soccer game pages.